Last weekend, BlogAdda had given our bloggers a WOW prompt, 'a day in the life of a rag-picker', waiting to see how you would respond. We were amazed at the amount creativity shown by you all! There was some really interesting posts and we are in awe! 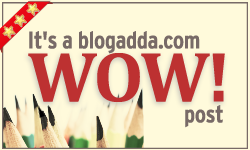 thank u team Blogadda for choosing my entry! !